So wrote Edward Said in regards to his great friend and mentor of sorts, Pakistani intellectual Eqbal Ahmad in the foreword for Confronting Empire, a collection of interviews between Ahmad and David Barsamian. Sadly however, the volumes Said had hoped for never materialised and Ahmad’s intellectual contribution has been increasingly overlooked in the years following his death in 1999. 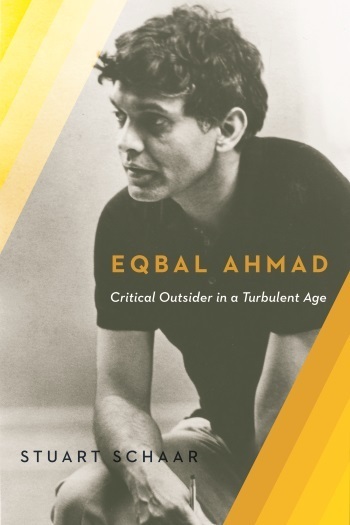 Addressing this gap, long-time friend and collaborator, Emeritus Professor of Middle East History at Brooklyn College Stuart Schaar recently authored the biography Eqbal Ahmad: Critical Outsider in a Turbulent Age, to several positive reviews. To aid his efforts, Schaar gained access to archives at Hampshire College where Ahmad once taught and­­­­­ left students enthralled. He also travelled the globe to speak to family members and former comrades of his Princeton class-fellow. In the book we learn of a young boy born in Bihar (India) traumatised by the murder of his father over a land dispute, and subsequently by the chaos of partition. Moving to Lahore, Ahmad gained his formal education from Foreman Christian College, following which he attained a scholarship to Princeton where he completed a PhD on the labour movement in Morocco. As the book progresses, we learn of the maturation not just of a radical intellectual heavyweight, but one actively involved in tackling contemporary world events, whether raging against the Vietnam war or supporting trade unions and revolutionaries in North Africa; or whether fermenting cross-cultural Indo-Pak ties or holding frequent fiercely critical interactions with Yasser Arafat and the PLO after building a close friendship with Edward Said. Not one to be easily categorised, Ahmad was no unrelenting pacifist, swimming against the tide even among his own leftist circles when he felt it necessary, arguing, for example, in favour of NATO intervention in the former Yugoslavia. Ahmad also alleged to have worked alongside Frantz Fanon (although somewhat controversially, Schaar denies this took place), and at one point found himself on trial for conspiracy to kidnap Henry Kissinger. Ever the idealist, he sketched a plan with anti-war Catholic priests to briefly detain the secretary of state in order to deliver him an education on the conflict in Vietnam. Among the priests with whom Ahmad engaged in acts of civil disobedience were famous pacifists the Berrigan brothers, the last of whom – father David Berrigan – sadly died earlier this month. You open the book with talk of Eqbal’s knack for predicting future events that later transpired, using six examples to illustrate this. How was it that in your words, he was ‘able to see trends emerging before his peers’? Eqbal read widely and had a profound knowledge not only of political science, but also history. He was an iconoclast and therefore did not accept the paradigms in fashion in his day. He started with different assumptions than his peers in international relations – anti-imperialism, critical of capitalism, and distrust of official policies and statements – allowing him to see events in an original way. He was also quite smart, making it easy for him to see through state policies and criticise them. He championed many unpopular causes and in that sense was riding against the tide, making it difficult to succeed in some of his campaigns such as around Bosnia and Kosovo. He also opposed the nuclearisation of the Indian subcontinent, but did not have any chance to affect policy because of the extreme nationalism present in India and Pakistan. He also opposed Indian partition and thought that it could be reversed. Intense nationalism on both side of the Indian/Pakistani border made that an impossible dream. As a cosmopolitan, in contrast to narrow nationalism, he faced insurmountable barriers that he could not overcome. That never stopped him from championing those causes that he thought right. Here was a figure who counted among his friends Edward Said, Howard Zinn, Noam Chomsky, Richard Falk and others, and was respected by these figures as a prodigious intellectual. Why is it that his name isn’t as well known among activist circles? By virtue of not writing the “big book” as Edward Said did with Orientalism, he was forgotten by all, but people over 40-50 years old who met him and remember him. The younger generation have found other heroes and heroines. I wrote the book to keep his memory alive and push people to read his collected works. Eqbal spent a lot of his time critiquing the scourge of nationalism, after breaking from his own while studying in the states. How do you think he would explain the jingoistic nationalisms of today; could he have imagined an India led by Narinder Modi, or the ascendency of Donald Trump? He wrote a great deal about the rightest trends in India, and of course he was very critical, especially of extreme Hindu nationalists attacking mosques and Muslim citizens. He was surrounded by jingoist nationalism, even among those that he tried to work with when he returned to Pakistan at the end of his life and it disturbed him. He was also a realist and joined groups that fought against blind nationalism. But that was like trying to swim against the tide, but he did it anyway because he thought that it was the right thing to do. Eqbal learnt that centralisation associated with revolutionary movements such as that in Algeria often inadvertently sets up structures that pave the way for military take-overs such as Colonel Boumediene’s. In the second chapter you talk about Eqbal exasperatedly shouting at President Ben Bella for betraying the revolution at a trade union meeting. Did Eqbal propose an alternate route in revolution or is this phenomenon an inevitability post-colonial states must resign themselves to? He wrote three critical long articles on the post-colonial state that should have been made into the core of an important book. [From Potato Sack to Potato Mash: The Contemporary Crisis of the Third World, Arab Studies Quarterly 2, no.3 (1980), Post Colonial Systems of Power, Arab Studies Quarterly 2, no.4 (1980), The Neo-fascist State: The Pathology of Power in the Third World, Arab Studies Quarterly 3, no.2 (1981)] He never found the time to write that book. I discuss those articles in a section of this biography starting on p.109 (US edition). He did not believe in inevitability and thought that activists had to fight fiercely for democracy. In Confronting Empire Eqbal talked about Tagore’s attitude towards nationalism, decrying it an ideology of exclusion. How necessary, however, is such an ideology as a vehicle to rid states of colonisers, as was the case in British India? Nationalism, of course, is a powerful force and Eqbal understood that. He also admitted that it was necessary in the anti-colonial struggle. But post-independence it could be nefarious and it was there that he criticised its worst aspects. Without strong legitimacy third world dictators used nationalism to consolidate and hold onto power. It was here that Eqbal criticised blind nationalism and saw it as a substitute for building strong institutions for state building. He came to oppose most partitions and favoured long negotiations over slicing countries into artificial pieces that needed jingoism to survive. Was this a pipe-dream? Was it utopian? Others thought so. He did not. In chapter four you mention Eqbal’s understanding of ‘Islamists’ as a ‘modern phenomenon, a response to the crisis of modernity and identity’ which, you explain, occurs when ‘societies moved from agrarian/ pastoral mode of production to the industrial…men and women who are stranded between the deep waters of tradition and modernity’. With a remarkable number of today’s fundamentalists hailing from urban centres with western educations, growing up playing video games – does his logic still hold? I think it does hold. After all, Muslims in the west are often alienated from their racist societies. Ghettos, where many are forced to live, do not foster integration despite all the rhetoric to the opposite. Alienation has little to do with levels of education or video games. Perceptions of reality and blocked opportunities because of cultural backgrounds push young people to join radical movements within Islam, which attack the perceived victimisers. Lack of meaningful work and career opportunities also kick in and radicalise young Muslims. You open the book ascribing Eqbal’s originality to his position as an outsider who was able to reach ‘maturity outside the frameworks of Pakistan’s social and political constraints’. Would you agree such positions of marginality are experienced increasingly today by second and third generation ethnic minority children growing up in the west; furthermore, do you see such marginality informing new waves of great intellectuals? I hope so. Seeing the world from the outside sometimes radicalises people. It does not happen in all cases. It depends on the baggage that a person brings to her/his reality. In Eqbal’s case, his family’s progressive tradition and his ultra-moral upbringing by his older brother radicalised him and positioned him to be an outsider in an amoral world. He had a sense of social justice that few other people possess. He also studied and wrote about people who tried to change the world and failed gloriously. Despite their failure, he saw that these people had a significant impact on their society’s ideology and choices. That is what counted for Eqbal. In the penultimate chapter you write: ‘When all the dictators and militaristic governments that the United States supported fell like a house of cards by the 1980s, Eqbal wondered in amazement how Kissinger with such a flawed global policy still remained a prized consultant of US Republican presidents and corporate executives’. He’s now a prized consultant of a certain Democratic frontrunner. How has Kissinger survived utterly unscathed? Kissinger represents hegemonic culture in the United States. As an employee of David Rockefellar, the president of the Chase Manhattan Bank, access to the US elite were opened to Kissinger. His major scholarly work dealt with how European conservatives, such as Metternich, kept conservative options alive in a revolutionary era. Conservatives like Kissinger because they think he knows how reaction can succeed. He is needed as an ideologue of reaction and status quo in a revolutionary world. Can you talk about any future projects you’re working on? I just finished writing a book about a war surgeon, Chris Giannou, who worked for the Palestinian Red Crescent organisation as a war surgeon for 12 years and then became head war surgeon worldwide for the International Committee of the Red Cross for several decades. He, like Eqbal, was a very close friend and because of that became a friend of Eqbal. He has served in many killing fields and the book reads like a James Bond novel, but it’s a true story. I have 100 pages written about an African American woman doctor who died at the age of 47 and was the head of social paediatrics in a major hospital in the Bronx New York. She tried to change the shelter system in New York City for homeless women without husbands but with children, and had a welfare practice in Manhattan. She was also a close friend and we grew up together. She was a marvellous person. I also have begun a book comparing Tunisia in the 1920s (an incredible period in Tunisian history) with the period of revolt after 2011, trying to show how the earlier history helped propel the country into a unique place in the Muslim world, being the only country which passed through the so-called Arab Spring and established a democratic society, rocky as it might be. I then will complete my own autobiography, the early parts of which have been published in English in Morocco. After that, who knows?